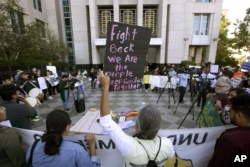 FILE – In this June 20, 2018, photo, protesters demonstrate outside the federal courthouse in Sacramento, Calif., where a judge heard arguments over the U.S. Justice Department’s request to block three California laws that extend protections to people in the country illegally. Sacramento is a sanctuary city. Pelosi’s hometown of San Francisco is a sanctuary city. 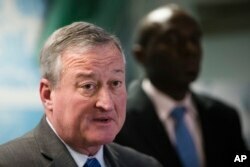 FILE – Philadelphia Mayor Jim Kenney speaks during a news conference in Philadelphia, Nov. 15, 2017.